Four gang members have been found guilty of ambushing two rival drug dealers and stabbing them to death to steal their clients. Aaron Carriere, 21, and Josiah Manful, 20, were stabbed 24 times in under a minute, the Old Bailey heard. The two men were "lured" to a road in Leytonstone, east London, in the early hours of 1 March 2014. Devonte Campbell, Casey Jones, Alex Bernard and Omar Hassan were found guilty of two counts of murder. The two victims were "boxed in" by the cars of their killers and set upon in their black Ford Fiesta in Montague Road, the court heard. The court heard the defendants had been "working as a team" to "lure" the two young men into a trap and kill them. Despite the fact there were drugs and cash in the car, only Mr Carriere's mobile phone was stolen which contained his drug dealing "client list". Mr Carriere was a "successful drugs dealer", selling crack cocaine, heroin and cannabis on the streets of Leytonstone and, unbeknown to him, was the subject of an undercover police probe. 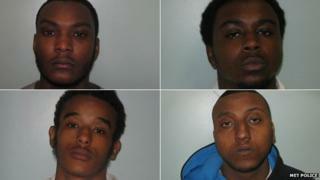 Campbell, 20; Jones, 19; Bernard, 21; and Hassan, 21; all from east London, had denied the charges. At the time of the killings Campbell, a known gang member, was serving a suspended jail sentence for perverting the course of justice. Wail Alawi, 23; Abraar Amin, 18; and a 17-year-old, who cannot be named for legal reasons, also from east London, were cleared of murder.